Tents and Shelters / Can you make your own silnylon? I am in the process of acquiring an older nylon tent. It has polyurethane on one side of the fabric. As with old polyurethane covered nylon, the poly is starting to break down and flake off. The construction of the tent is such that I can't spray new polyurethane on the underside of the nylon, but I can get at the top side. Somewhere I saw where someone (it may have been here) took a tube of 100% silicone caulk and dissolved it in a solution to thin it out, and then painted or sprayed it on untreated nylon to create their own silnylon. Anyone heard of this being done or have any experience with it? I am tempted to try it if it might work. $340.00 American for a 4.5 lb folding Ti stove with a roll up pipe. Looks like it has a stack robber, too. 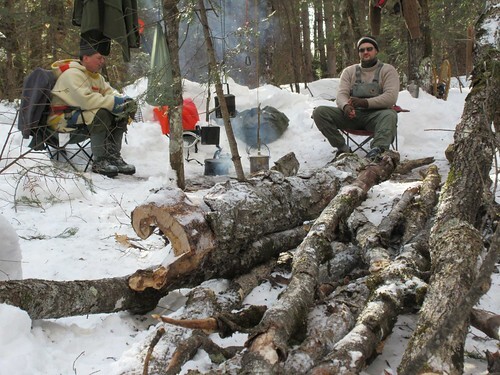 A bunch of us from the Bushcraft USA website are planning a Winter campout at Bond Falls Flowage (Paulding, MI) the weekend of Feb. 8-10. Check the Bushcraft USA website for updates. Everyone is welcome. Originally $250.00, now $100.00 with SG membership. This is an interesting concept, although I am not sure how practical it would be in an enclosed tent. The top of the stove comes completely off and the base can be used as a grill. The price is not bad at $109, including shipping. No weight is given for the stove, and no diameter is given for the stove pipe. The stove looks like it has a fairly tight sealing front door, and there is the option top load/pot opening. Additional stove pipe is available, as are 45 Deg elbows. Looks like it is about 18" long, and stove diameter is 10", meaning its use would be confined to smaller tents, or warmer weather. Well, sad to see it happen, but we are having temps in the 50s here all week, and the snow is rapidly melting, so I think Winter is gasping its last breath. Outings now will be confined to car camping because it's the only way to haul gear. Lakes are still frozen, so I suppose you could start on a shore go over the ice, but I think ice routes are the only thing left to carry gear on a pulk or sled. I got out once this Winter for an overnight. It was fun, but not nearly enough. Wife broke her leg after slipping on ice 6 weeks ago, so that ended any possibility that she'd be able to join me. 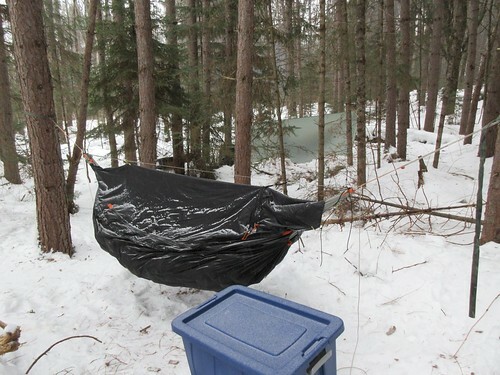 That, combined with work and travel just didn't leave much time for Winter camping. I guess I can look forward to next year. I have enjoyed all of the trip reports and banter here. I can tell by the lack of posts here the last few days that everyone else is probably suffering the end of the season doldrums, too. General Winter Camping Discussion / What Criteria Govern Your Choice When Selecting Winter Camping Gear? Winter camping requires gear. I got to wondering about why people choose a particular piece of gear, and the things that effect their decision? Looking online for a place to buy UHMWPE from at a reasonable price. I only found a few sites in the U.S., and the prices seem high ($150+ shipping for a 1/16" 4' x10' sheet). I tried to place an order, and the site wouldn't let me select shippping, I suspect because one sheet wasn't enough for them to mess with. Anyone have a reasonable source that will ship? I am thinking about making a pulk out 1/8" UHMWPE. Anyone have any suggestions, plans, etc? I know some on here have done it and just wondering in hindsight, if you did it again, would you do anything different? My Sportsman's Guide pulk works good, but is very heavy at about 35 lbs. If I could get rid of most of that weight, it might make the pulling a bit easier. My Sportsmans Guide surplus pulk has J hooks for cross lashing the load. One end of these hooks looks like a J and the other end has an eye to pass a rope through. In some of the photos here, I have seen people using the same hooks for lashing and I am wondering if anyone has a source? Thanks. This past weekend, a friend and I joined three other Winter campers for an outing in Michigan's Upper Peninsula. Let me say at the outset that I forgot to take pictures while we were set up, so you will have to live with my written report, and a few pictures taken by lonetracker. 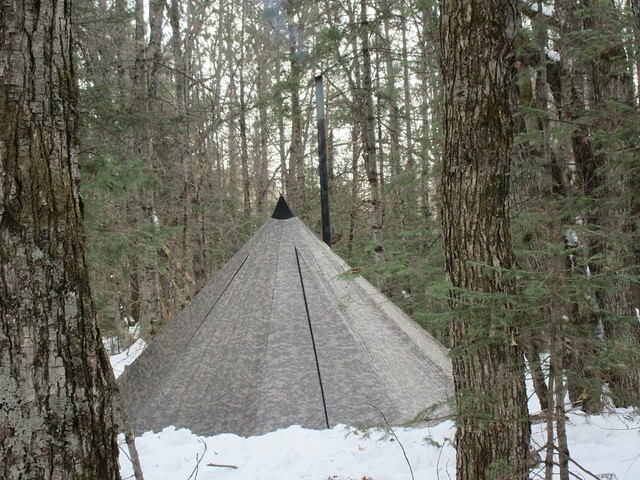 I originally had a canvas wall tent packed, but going with the tipi saved us about 6 lbs. We had a small 4 Dog Ti stove for heat. Cots to sleep on with Exped down mats under us. My dog, Kipper, accompanied us. He is a Hungarian Vizsla, so he is really not equipped with a good fur coat for cold weather. Daytime temps were in the mid-twenties F, so he would be fine as long as he was running around. We cut dead standing maple for the wood stove. It appeared to be dry, but seemed a bit too heavy to be totally dry wood. We got a good fire going in the woodstove with some smaller branches and the tipi heated right up to about 70 deg F.
One of the other campers brought a fold over, hinged metal grill with a nice handle that I borrowed to cook our dinner of marinated beef bottom round. The grill saved us from having to cut wood skewers to cook the meat on. About the time I got all of the meat sandwiched in the grill and over the fire, the clip on the handle let go, the grill sprung open, and most of the meat was catapulted into the fire. We scrambled to pull the meat out of the fire and managed to recover all of the pieces before they burnt up. The wood ashes covering the meat added a nice compliment to the delicate flavors of the sesame ginger marinade. I forgot the frozen vegetables back home in the freezer, so dinner was rounded out with two foil covered sweet potatoes baked on top of the wood stove. A few words spoken at the perpetual wood fire and a glance at a night sky full of stars, and we were ready for bed. After retiring to the tipi, we stuffed the woodstove with some of the bigger pieces of maple, which were about 3-4" in diameter. I had already retired to my sleeping bag when I realized the wood was clearly damp, so I told my friend who was still up and moving around to adjust the draft on the stove to give it more air, and to also adjust the damper in the stove pipe to do the same. My friend was not familiar with the stove, so he managed to open the draft and the damper all the way up(I could not see the front of the stove from where my cot was), which was fine while the damp wood burned slowly inside the stove. I fell asleep all warm and comfy, thinking how nice it was to have the 4 Dog simmering away, and taking the chill off the night inside the tipi. It has been my experience that when you stuff a wood stove that already has a good bed of hot coals in it with damp wood, eventually the damp wood dries out. You now have the draft and damper open to give more oxygen to help the damp wood burn well, but when the wood eventually dries out, if you are not paying attention to the stove, all of the extra combustion air will cause the stove to take right off like a rocket. I fell asleep with my back to the stove, only to wake up about an hour later to find my that my backside facing the stove felt like it was getting broiled. I rolled over to see the stove glowing cherry red like a meteorite in the middle of the tent, and about the first 4' of pipe glowing the same red color. Panicked, I rolled off of my cot and pushed the draft shut from the side, and closed down the damper, too. Because I adjusted both the draft and the damper from the side, I could not tell how much I managed to close either one, but the stove settled right down and I again fell fast asleep with visions of snow nymphs dancing in my head. The dog took up shelter starting on the foot of my cot, tucked in behind my bent legs. All seemed well at this point in time, and the tipi was a very comfortable warm temperature inside as the stove gradually slowed down. I awoke a couple of hours later to the dog shivering at the end of my cot. My face was cold, and I could no longer see flames from the stove flickering on the tipi wall. I then realized that my earlier attempts to regulate the draft and damper on the stove had gone too far, and I thought I had managed to choke it out. In my haste to pack I had forgotten to bring a flashlight, and I did not feel like getting out from under my warm sleeping bag to try to restart the fire. We had good down bags and would survive the night without a fire. The dog did not take well to surviving the night without a fire. He was laying at the end of the cot shivering like a hound dog crapping a peach seed, to the point that the cot was shaking so bad I could not fall back alseep. I had my bag open and draped over me like a quilt when I fell asleep in the warmth of the previously burning stove, so I lifted up the corner and invited the dog under it, an invitation he happily obliged. He promptly crawled under the bag with me and slid right up next to me to take advantage of my body heat. Although it was dark in the tipi and I could not see the dog, I suspect he had a smile on his face at that point in time. If you are familiar with down air mats, you know that they have two valves, one to let in air as you are pumping the mat up, and one to let air out when you are deflating it. In his haste to join me under the sleeping bag, the dog managed to step on the cover to the valve used to inflate the mat. Although that valve will hold air in the mat, it does not seal well without the cover locked down on top of it. Slowly, without me being aware of it, the mat began to leak air and collapse. Filled, a down mat is very warm to sleep on. Collapsed, it was like sleeping on the 4 degree air that was now inside of the tipi without the woodstove going. Suffice it to say, the dog slept well. Me, not so good. I woke up in the morning feeling like I had been run over by a Mack truck. Old bones, especially hip bones and back bones, do not handle sleeping on a cold cot very well. We managed to leave the cooler outside the tipi, so the bananas that we hauled in were frozen like metal horseshoes. At that point, a decision was made to break camp early, haul our stuff out to the truck, and head for breakfast at the restaurant in town. The last thing I did before striking the tipi was carry the wood stove outside to empty the dead ashes out. You can imagine my surprise when I dumped the stove, only to find plenty of still glowing coals inside to have been able to relight it during the night when I thought it had gone out. Never let it be said that a 4 Dog stove will not hold a good bed of coals. In the end, a good time was had by all. In hindsight, you can laugh at most anything that you survive. Today I ordered a 4'x6' welding blanket off of Ebay. I plan to hang it between my stove and the walls of my tent to keep the canvas from getting scorched. My stove is positioned in the corner of my Snowtrekker. So far, not a problem, but it only takes a moment of not paying attention to how hot the stove is getting before things can get bad. The blanket was less than $18.00, with free shipping. I figure it is cheap insurance. Wondering if anyone else has done this? I'm guessing it is lighter or about the same weight as metal reflectors.